This wheel was built by Hed for us with Nexus 8 Speed Premium “Red Band” attached to an Ardenne. 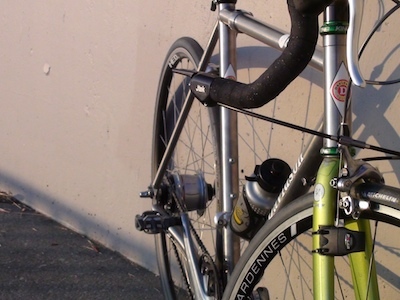 The Nexus connects to a Jtek bar-end shifter. The initial ride report is smooth and what we’d expect from the setup. Mark geared it to cruise along the flats and climb Seattle’s steep hills with a 39 x 21. Note that the drivetrain works like a bar-end shifter connected to a Rapid Rise MTB derailer: moving the levers has the opposite effect. It’s reversed. The shifting is responsive, tight, and feels like Ultregra. You can palm the shifter for quick shifting and I got used to the reverse setup within a few shifts. Other internally-geared hubs require you to stop pedaling to shift. The Nexus Red Band does not. I ran through the gears up and down and J-tek’s indexing is audible enought to hear the shift: not vague and sounds solid. 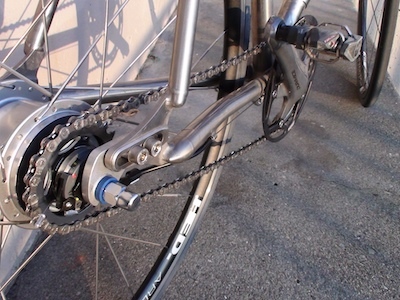 Mechanics have always hacked various drivetrains bits, including various drop-bar setups. While this is technically a hack, it doesn’t shift like one at all. The Nexus of course adds weight, but nothing that noticeable. It doesn’t feel like there’s a boat anchor attached to the back of a reasonably light road bike. We’ll spend much more time on this bike going into the late Summer and Fall. The next challenge is to travel with it.